The WEMPE drum barographs are produced in several editions in Germany and visualize changes in atmospheric pressure on the barometer display. The air pressure is measured by eight pressure drums and drawn on diagram paper in fine lines. The drum is operated by a battery-powered quartz movement. 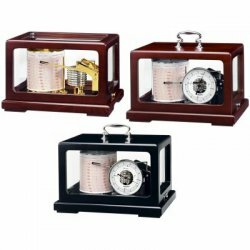 The classical electromechanical drum barographs manufactured by WEMPE weigh approximately three kilograms and are useful to everybody with a passion for traditional weather monitoring stations and to those who are looking for an extraordinary instrument of maritime lifestyle. The metal elements of the barometer are made from polished brass, either chrome or gold plated, and embedded in a noble mahogany or wooden black enclosure. The according diagram paper (in hPa or Inches) for one entire year and a fibre pen also belong to the scope of delivery.